Vol. IV Discussion—What Say You? With very little fanfare save for the light breeze made by page turning, Vol. IV came to a close a week ago. That’s four down and one to go—though if you’re like me, you’ve peeked more than once at the final volume. As is our custom, we’ll take a week or two of wrap-up time to comment on more of the text, as well as to perhaps ask some global questions and discuss the big points of the volume. And what a volume it was. Prof. Taruskin rocked several boats holding the traditional thinking on twentieth century music. Some of the biggest he salvoed and aimed to sink. He moved the inception of the musical “twentieth century” back by more than a decade, redefined its central characteristics (neoclassicism, ban of pathos, irony), and argued for a repositioning of the era’s most important philosophers (notably a increasing the importance of Ortega y Gasset and decreasing that of T.W. Adorno). The influence that these changes and challenges might have on the teaching and understanding of music history is well worth discussing, and I’d like to open up a discussion here. Teachers: how have you used Taruskin’s arguments in your presentation of the narrative of twentieth century music? To what effect? Students: how have Taruskin’s revisions and emendations affected the way you understand early twentieth century music? Challenges of your own? Seconding Prof. Taruskin’s arguments? Questions or ruminations? Let’s get this comments section working—pathos and irony allowed. At the beginning of the 16th century, Josquin des Prez was one of the first composers to gain widespread renown through the printing press. Gottschalk accomplished his national success by riding the cross-country American railroad system in the 19th century. Enrico Caruso was the first international recording star, beginning in the first decade of the 20th century. Arturo Toscanini’s widespread celebrity as a conductor was amplified exponentially through the new medium of radio broadcasts beginning in the late 1930s (Vol. IV, 752). The contours of music history are bound by the history of technics, and vice versa. And as I pointed out in an earlier post, sometimes the nature of one’s success is dictated by when one is born, and what technology is available to you—or invented by you. More recently we’ve had the music video star (Michael Jackson), the youtube “star” (more infamous than famous, usually), and the indie-“wunderkind”. One can only imagine—what’s next? 12-tone music (and atonality more generally) has a reception problem. On the one hand, the mathematical rigor of the compositional process (poiesis) lends it the elite prestige that all things “scientific” garner in the modern world. RT identifies this extreme focus on musical ends rather than means – high academic modernism’s “cult of difficulty” – as a “deliberate strategy… keeping the hostile crowd at bay” (IV, 738). Listeners may not like the music, but, understanding that its composition is akin to research in particle physics – in other words, recognizing that it’s way over their heads anyway – listeners can accept its “necessity.” One takes it at a concert much like one takes a dose of cod liver oil. It’s fascinating to me how, out of all the “high modernist” art forms, atonality (especially 12-tone music) has been perhaps the most stubborn to absorption into the cultural bloodstream, at least in the concert-going world (movies are another question). Corporations display Kandinskys in their lobbies, yet Webern continues to arouse ire among subscribers in many an American concert hall. A hundred years later and it’s still controversial with audiences. Preoccupied with its “difficulty,” it’s easy for listeners to feel stupid and alienated; after all, it shouldn’t take a Ph.D. to listen to music. This is deeply unfortunate. There is more to the Second Viennese School than pure poiesis, despite the fact that, as RT laments, “… the ‘esthetic’ aspect – the relationship between the music and its audience, or the impact the composer seeks to make on a hearer – is rarely addressed” (ibid). I recall my first concert experience with Webern (Oliver Knussen with the New World Symphony playing 5 Pieces, Op.10). Never mind its “difficulty,” this music was a sensual epiphany. Knussen lovingly and delicately presented us with five wildly, extravagantly flavored tiny morsels of sound, like rich and unusual chocolates in a box. Each bite was a universe of sonic sensations. After finishing, he turned to the audience and, with the playful naughtiness of a young boy sneaking a cookie, asked if we minded that he played the whole piece once again. We were all intoxicated with Webern. In my company that evening was a friend who was, to say the least, highly skeptical going into the concert. A rock fan with little or no experience in classical music, she was mystified and fearful of the legendarily “difficult” reputation of the music. (In fact, she even had an excuse to bow out during intermission if her ears were intolerably assailed.) How did she take this performance of Webern? Let’s just say there’s now a CD or two between Tom Waits and Wilco in her music collection. Motivic unity be damned, she was mesmerized by the sheer, luxuriant sonic surface of it. Actually listening to Webern is a very different experience than either reading about Webern or analyzing Webern’s scores. And it is here that Second Viennese atonality has a PR problem: its intense logic and formal complexity begs it to be read as a gnomic text, yet the way it sounds at its best moments – captivating, evocative, surprising, and chaotic – can be grasped without the aid of the score. All music is about sound, of course, but by fixating on structure and technique (poiesis) – its “difficulty” – at the expense of its sensual sonic surface, a strategy that RT is guilty of, even though he recognizes the bias, it’s easy to forget what a singularly bewitching sound world we’re dealing with. Close the score and listen to Webern – you might be surprised. Stravinsky and Schoenberg represented two wildly divergent paths forward after the war. Unsurprisingly, they didn’t think highly of each others’ music, and the rancor over whose definition of “modernism” was the most true to history occasionally turned to outright mockery (Schoenberg referred to his competitor as “little Modernsky,” for example). Indeed, the cool and restrained neoclassicism championed by the Russian seemed miles apart from the red-hot, wild expressionism (or, to detractors, “romanticism”) of the Austrian. But in many ways the 12-tone technique was just as classicizing as Stravinsky’s neoclassicism, just as driven by the primacy of rationality over pathos, and just as fundamentally ironic in outlook. Take the formal structures (“containers”) that characterize Schoenberg’s first full-scale 12-tone piece, Suite for Piano, Op.25. With a Präludium, Gavotte, Musette, Intermezzo, Menuett, and Gigue, we’re back in the territory of “Papa Bach’s” pedagogical keyboard works, a bizarre and incongruous fit for the extreme dissonance contained therein. (We’re also back to dance forms, which is another tasty irony considering the lack of motoric regularity in Schoenberg’s music.) As RT notes, these are patently (if not risibly) “feather-light” forms put to the service of one of the most extravagantly intellectualized compositional techniques ever devised. Why would Schoenberg, a la Stravinsky, turn back the clock to mine obsolete forms from the 18th century? In addition – and this is a point about Schoenberg that doesn’t often seem to be discussed – the adoption of Baroque/Classical forms shows the composer poking gentle fun at his own 12-tone pretense. Take the “Menuett” movement, whose trio section unfolds in the form of a strict mirror canon. Contrapuntal exactitude is rendered absurd in an “emancipated dissonance” context, not that a listener would be able to tell anyway. This technique, which results in grotesquely jagged figuration, “shines such a garish spotlight on the contour inversion as to leave no doubt that the composer is in on the joke” (695). Or how about the “Musette” mentioned above, which references the traditional bucolic imagery of droning bagpipes with a recurring tritone (the tell-tale sign of an unreconstructed expressionist). In on the joke, indeed. 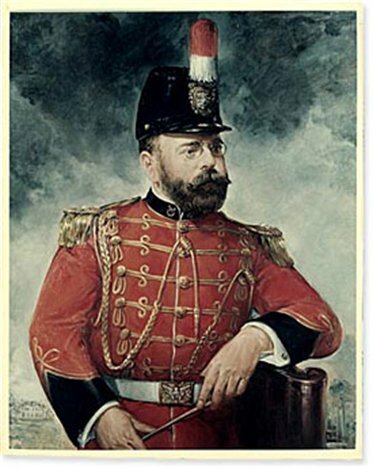 In a comment to my last post on musical Americanisms, reader Bodie asked after another “forgotten giant” of American music, John Philip Sousa. (Taruskin does in fact mention Sousa, though only briefly and as a secondary point to his discussion of Charles Ives in Vol. IV.) So I thought I might let Sousa speak for himself on the topic of America’s musical place vis-à-vis Europe. And from Sousa’s point of view, it was not as a meek supplicant content with playing second-piccolo to the big-boys. His article was in turn criticized in print by an anonymous American, signed “Musician”—whom Sousa suspected to be a Frenchman in disguise—who was flabbergasted by Sousa’s hubris. The thought of an American prescribing musical curricula for the French, an ancient musical powerhouse, was offensive to “Musician,” and purportedly to many others. The implication is that Americans, like they had done in the area of technics, could advance the art of music into the modern era, electrify it, even. Sousa was not naive, as a musician, author, or businessman. He did not have scorn for the “old masters,” as is plainly seen by his programming choices, which frequently included arrangements of Wagner, Verdi, and other “classics.” But Sousa was confident. At the dawn of the 20th century America was flush with innovative spirit, and as Sousa exemplifies, musicians were not immune to it. Sousa’s band was indeed a great success on that European tour. How did an American, one of the “grateful children” of Western art music, win this small conquest of his elders? He believed he could do it in the first place. *John Philip Sousa, Marching Along: Recollections of Men, Women, and Music (Boston: Hale, Cushman & Flint, 1941 ). Around the turn of the 20th century, Dvorak famously gave his predictions about the repertoires that would be the wellspring of an American national style. Though a hopeful prediction, it also served as a stinging reminder that no such style yet existed, something that American composers were well aware of. Between the wars, several candidates arose to fill the vacancy. Would it be the uniquely American “folk” music, jazz? Copland and Gershwin, not to mention Duke Ellington (Taruskin, in fact, doesn’t mention him), all wrote concert pieces in “jazzy” styles. Jazz also made the leap across the pond and became a short-lived vogue, especially with French composers. Would it be the wild, free, “self-made” musical language of Roy Harris, symphonist and later film composer? (IV, 640) Was it in the expanse of the prairies? the folklore of the Appalachians? the spirit of the American working man? There is no answer to this question, per se, no “natural essence” of American music (IV, 673). The only “answer” we can claim is the discourse of artistic creativity that such a question ignites.